There was a slight change to the BurgerBash Schedule of times and below is the new corrected timeline for Saturday. 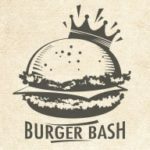 The chef’s will present their burgers to the judges starting at 12:15 pm on Saturday then ever 15 minutes until all 7 chef’s have presented. The public is welcomed to watch the judging and listen to the chef’s explain their burgers. The public sampling and People’s Choice voting will begin around 2 and end around 4. Winners will be announced around 4:15 pm.